Fred David Gray (born December 14, 1930) is a civil rights attorney, preacher and activist who practices law in Alabama. He litigated several major civil rights cases in Alabama, including some that reached the United States Supreme Court for rulings. He served as the President of the National Bar Association in 1985 and in 2001 was elected as the first African-American President of the Alabama State Bar. Born in Montgomery, Alabama, Gray attended the Loveless School, where his aunt taught, until the seventh grade. He attended the Nashville Christian Institute (NCI), a boarding school operated by the Churches of Christ, where he assisted NCI president and noted preacher Marshall Keeble in visiting other churches of the largely white denomination. After graduation, Gray matriculated at Alabama State College for Negroes, and received a baccalaureate degree in 1951. Encouraged by a teacher to apply to law school despite his earlier plans to become a historian and preacher, Gray moved to Cleveland, Ohio, and received a juris doctor degree from Case Western Reserve University School of Law in 1954. At the time there was no law school in Alabama that would accept African Americans. After passing the bar examination, Gray returned to his home town and established a law office. He also began preaching at the Holt Street Church of Christ, where his parents had long been devout members. In 1957, Gray fulfilled his mother's dream by becoming a licensed preacher of the Churches of Christ. In 1974, he helped merge the denomination's white and black churches in Tuskegee, Alabama, where he had moved. Gray also served on the board of trustees for Southwestern Christian College, a historically black college near Dallas, Texas affiliated with the Churches of Christ. In 2012 Lipscomb University in Nashville, Tennessee, also affiliated with the Churches of Christ bestowed a doctorate of humane letters honoris causa upon Gray in 2012. Gray once challenged Lipscomb's segregation practices. During the Civil Rights Movement, Gray came to prominence working with Martin Luther King, Jr. and E.D. Nixon, among others. In some of his first cases as a young Alabama attorney (and solo practitioner), Gray defended Claudette Colvin and later Rosa Parks, who were charged with disorderly conduct for refusing to seat themselves in the rear of segregated city buses. Gray represented the Montgomery Improvement Association during the more than year-long Montgomery Bus Boycott of 1955, which ultimately led the United States Supreme Court to condemn bus segregation practices in the case which started with Colvin's action, researched and filed by Gray, Browder v. Gayle. After Alabama Attorney General John Malcolm Patterson effectively prohibited the NAACP from operating in Alabama in 1956, Gray provided legal counsel for eight years (including three trips through the state court system and two through federal courts) until the organization was permitted to operate in the state. He also successfully defended Dr. Martin Luther King, Jr. from charges of tax evasion in 1960, winning an acquittal from an all-white jury. Other notable civil rights cases brought and argued by Gray included Dixon v. Alabama (1961, which established due process rights for students at public universities), Gomillion v. Lightfoot (1962, which overturned state redistricting of Tuskegee that excluded most of the majority-black resident; this contributed to laying a foundation for "one man, one vote") and Williams v. Wallace (1963, which protected the Selma to Montgomery marchers). In another Supreme Court case, Gray was driven in his efforts to have the NAACP organize in Alabama after the group was forbidden in the state. Alabama resisted integration of public schools following the U.S. Supreme Court's decision in Brown v. Board of Education (1954) that ruled segregation of public schools was unconstitutional. Gray successfully represented Vivian Malone and James Hood, who had been denied admission to the University of Alabama, and they entered the university despite Governor George Wallace's Stand in the Schoolhouse Door incident. In 1963 Gray successfully sued Florence State University (now University of North Alabama) on behalf of Wendell Wilkie Gunn, who had been denied admission based on race. Gray also led the successful effort to desegregate Auburn University. In 1963 Gray filed the Lee v. Macon County Board of Education case, which in 1967 led a three-judge panel of U.S. District Judges to order all Alabama public schools not already subject to court orders to desegregate. Lawsuits filed by Gray helped desegregate more than 100 local school systems, as well as all public colleges and universities in his home state. In 1970, Gray, along with Thomas J. Reed, became the first African Americans elected as legislators in Alabama since Reconstruction. Gray's district included Tuskegee and parts of Barbour, Bullock, and Macon counties. Gray's autobiography, Bus Ride to Justice, was published in 1994, and a revised edition in 2012. Gray also represented plaintiffs in the class-action lawsuit about the controversial federal Tuskegee Syphilis Study (1932-1972). During the Great Depression, the study was changed to review untreated syphilis in rural African-American male subjects, who thought they were receiving free health care and funeral benefits. Gray filed the case, Pollard v. U.S. Public Health Service, in 1972, after a whistleblower reported the abuses to the Washington Star and New York Times, which investigated further and published stories. In 1975, Gray achieved a successful settlement for $10 million and medical treatment for those 72 subjects still living of the original 399. (Penicillin had become a standard treatment by 1947, although research subjects were specifically denied that treatment as well as their true diagnosis.) The 40 subsequently infected spouses and 19 congenitally infected children were compensated with medical,health and burial benefits managed by the USPHS's Centers for Disease Control and Prevention (CDC) several years later. As a result of the lawsuit and settlement, the 1979 Belmont Report was prepared and Congress passed federal laws. These were implemented by establishing Institutional Review Boards for the protection of human research subjects and the National Commission for the Protection of Human Subjects of Biomedical and Behavioral Research within the Department of Health, Education and Welfare, now the Office for Human Research Protections (OHRP) in the Department of Health and Human Services. In 1997 Gray founded (and subsequently served as president and board member of) the Tuskegee History Center. This nonprofit corporation operates a museum and offers educational resources concerning the Tuskegee Syphilis Study, as well as contributions made by various ethnic groups in the fields of human and civil rights. On January 10, 1980, President Carter nominated Gray to be a judge on the United States District Court for the Middle District of Alabama, to fill a vacancy created by Judge Frank Minis Johnson's elevation to what then was the United States Court of Appeals for the Fifth Circuit. Gray later asked his nomination be withdrawn, as happened on September 17, 1980; President Carter instead nominated Myron Herbert Thompson to that seat. Gray married the former Bernice Hill, his secretary, in 1955, and they had four children. He is also a member of Omega Psi Phi and Sigma Pi Phi. In 1980, the Southern Christian Leadership Conference awarded Gray its Drum Major Award. In 1996, the American Bar Association awarded Gray its Spirit of Excellence Award (having awarded him its Equal Justice Award in 1977). The National Bar Association awarded him its C. Frances Stradford Award. In 2002, Gray became the first African-American president of the Alabama Bar Association. In 2006, the NAACP recognized Gray's accomplishments with the William Robert Ming Advocacy Award, citing the spirit of financial and personal sacrifice displayed in his legal work. Gray is portrayed by Cuba Gooding, Jr. in the 2014 film Selma, which dramatizes the Selma to Montgomery marches and Gray's argument before Judge Frank Johnson that the march should be allowed to go forward. Shawn Michael Howard portrays Gray in the 2001 film Boycott, in which Gray, himself, plays a cameo role as a supporter of Martin Luther King Jr..
Gray was depicted in the 2016 stage play The Integration of Tuskegee High School. The production premiered at Auburn University, was written and directed by Tessa Carr, and dramatizes Gray's involvement in the case of Lee v. Macon County Board of Education. Gray is depicted in a 2018 episode of Doctor Who, "Rosa". ^ "Honoring Fred Gray" (PDF). Addendum. Alabama State Bar. February 2015. Retrieved 30 July 2017. ^ a b c d e f Key, Barclay (15 April 2008). "Fred Gray". Encyclopedia of Alabama. Retrieved 30 July 2017. ^ Ross Jr., Bobby; Jones, Kristi (August 2012). 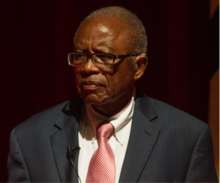 "Black, white and gray: Civil rights attorney who once challenged Lipscomb University in court receives the Christian university's highest honor". Christian Chronicle. pp. 1, 14–15. ^ "Gray, Fred David, Sr". The Martin Luther King, Jr. Research and Education Institute. Stanford University. Retrieved 30 July 2017. ^ "Biography of Fred Gray". Biography.com. Retrieved May 28, 2017. ^ Smith, Jessie C. (2002). The Martin Luther King, Jr. Research and Education Institute. Visible Ink Press. ISBN 1578591422. Retrieved 30 July 2017. ^ Douglas, Carlyle C. (January 1971). "Black Politics in the New South". Ebony. Retrieved 30 July 2017. ^ Gray, Fred [David] (2012). Bus Ride to Justice: Changing the System by the System, the Life and Works of Fred Gray (Revised ed.). Montgomery: NewSouth Books. ISBN 1588382869. ^ Gray, Fred [David]. The Tuskegee Syphilis Study: The Real Story and Beyond. Montgomery: NewSouth Books. ISBN 1588380890. ^ "Tuskegee History Center". Tuskegee Human and Civil Rights Multicultural Center. Retrieved 30 July 2017. ^ "Nominations Submitted to the Senate". The American Presidency Project. 11 January 1980. Retrieved 30 July 2017. ^ "Nominations Submitted to the Senate". The American Presidency Project. 15 September 1980. Retrieved 30 July 2017. ^ Bishop, Quinest (1 February 2015). "Historical Marker unveiling honoring Civil Rights Attorney Bro. Fred Gray". Omega Psi Phi Fraternity Inc. Retrieved 30 July 2017. ^ "Sarasota Community Says Thanks to Archon Fred David Gray". Sigma Pi Phi Fraternity. Retrieved 30 July 2017. ^ Benjamin Todd Jealous (January 2012). "Memorandum to NAACP Units and State Conferences" (PDF). NAACP. Archived from the original (pdf) on March 3, 2016. Retrieved March 3, 2016. ^ Dyleski, Taylor (April 2016). "'The Integration of Tuskegee High School: Lee v. Macon County Board of Education' opens April 14 at Auburn University". Auburn University. Retrieved 2013-05-23. This page was last edited on 3 April 2019, at 22:03 (UTC).